A small village in the heart of rural Wales has become the first community in the world to be connected up to ultrafast fibre broadband thanks to an aerial drone. 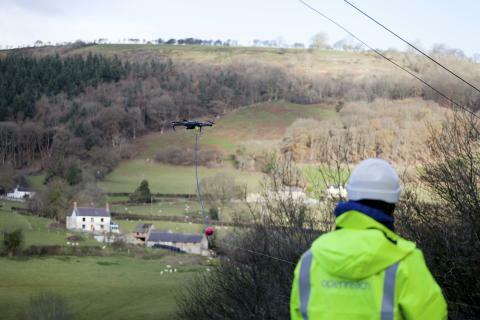 Homes and businesses in the village of Pontfadog, near Llangollen, can now enjoy some of the fastest broadband speeds in Britain after an inventive team of engineers from Openreach used a drone to land cabling on an isolated group of homes under the Superfast Cymru partnership. Until recently, the properties in Pontfadog were one of the few remaining communities across Wales which are yet to gain access to high-speed fibre broadband, either via private enterprise investment, or as part of the jointly funded Superfast Cymru programme. Set deep in the Ceiriog Valley, a team of engineers were faced with routing fibre cables over steep valley slopes, through a thick forest area and across a small river just to provide fibre broadband to twenty homes dubbed by other villagers as the ‘dark side’ because of their detachment. The challenging rural terrain meant traditional engineering methods like digging trenches and erecting roadside cabinets had to be ruled out and - given its location in the valley - providing a wireless connection using satellite or radio wasn’t an option either. It looked at one stage like the residents might miss out altogether until Openreach engineers came up with innovative airborne solution. Openreach’s Chief Engineer Andy Whale, who led the team, explained: “It’s a bit different to connecting an apartment block in London, that’s for sure. The portable drone used by the team was too small to lift the fibre cable itself, so they hooked it up to a length of high strength fishing line which was then flown around 100 meters and dropped across the top of the trees. That line was attached to a draw-rope – itself attached to a fibre cable – which could then be pulled along the unobstructed route laid by the drone. After connections were made at each end, all twenty premises were linked up with cutting-edge Fibre-to-the-Premises technology (FTTP) running all the way back to the exchange in nearby Oswestry. The technology is capable of delivering up to one gigabit per second (1Gbps) download speeds – which is enough bandwidth to stream 200 HD Netflix movies simultaneously. Villager Chris Devismes, who lives in one of the twenty homes, is one of the first to get connected up to the new high-speed network. He said: “I’m an aspiring writer, I work from home and publish my work online - so I do send full novels over the web to my editor or to readers. Before I would go away and cook tea whilst a file upload went through, but now it literally takes a matter of seconds. Ed Hunt, regional director for Openreach, added: “Pontfadog is a great example of how our engineers never give up. They look at every possible engineering solution to deliver fibre broadband in isolated rural areas, and when the more traditional methods didn’t work, they came up with the rather simple yet ingenious idea of using the drone. “We’re not aware of this technique being used anywhere in the world to deliver fixed line broadband in such a situation and we’ll be looking to see if it can be replicated for other communities that are in a similar position. If continuing trials prove successful, Openreach is looking at plans to equip and train selected engineers to pilot drones in engineering teams across the UK. According to the latest independent data from Thinkbroadband.com, more than 92 per cent of Welsh homes and businesses can now access superfast broadband speeds of 24Mbps and above and across Wales more than 650,000 properties have gained access to speeds of more than 30Mbps as a result of the Superfast Cymru partnership. Superfast Cymru is the partnership between the Welsh Government, BT, UK Government and the European Regional Development Fund (ERDF), bringing faster broadband to areas which would otherwise not receive it. The Welsh Government also runs the Access Broadband Cymru scheme, which can offer assistance to those not able to access superfast broadband by providing grant aid to help them receive it through other technologies.